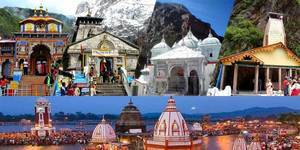 Shrine Yatra’s Chardham Yatra from Haridwar consists of a delightful tour to India’s four scared shrines including Kedarnath, Badrinath, Gangotri and Yamunotri. Situated at the mid of Himalayas, each of the Shrines offer you a world of serenity, peace and helps you and your family feel more connected to the divine. Surely a once in a lifetime experience that you should not miss out on.